I went to a conference last weekend, and asked my husband, who is hands down the better baker in our family, to find a grain free bread recipe. He found one and modified it a bit and made this for me when I returned home on Sunday (what a guy!) and it was very good. It is hard to find “bread-like” consistency without using grain or yeast, and this bread is denser, more like pound cake consistency, but it worked for my craving to occasionally have almond butter on bread! I have used it as a quick snack this week, and it has survived for 7 days now in our frig in a ziploc. Sharing with you, and I’d appreciate feedback! Pros: amazingly low carb (3 net carbs! ), high protein (7g) and easy to make, especially for non-bakers! *you can use any oil, coconut will impart a coconut flavor, and my opinion is olive oil would be too strong. Other healthy options would be avocado. Preheat oven to 350° F. Generously grease a 8½ inch loaf pan with coconut oil or ghee. Don’t use sprays, use real oil. Mix the dry ingredients in a bowl: flours, baking soda, salt. Set aside. Put the eggs in your blender and pulse on high for 10-15 sec. until frothy. Then add ghee, water and vinegar and process a few seconds until combined. Dump the dry ingredients into the blender all at once. Now here’s the tricky part: process for only 10-15 seconds, until the dry ingredients mix with the wet ingredients. Do not wait, or the dry flours absorb the wet ingredients and become too thick for your blender to process it. If this starts to happen, or your blender isn’t high powered, dump it all into a bowl and hand mix to finish it. Remember, you want it mixed quickly. Pour the mixture into your greased loaf pan and smooth the top so it is even. Bake for 50-70 minutes, until a tester inserted into the center comes out clean. Cool for 10 minutes, then run a knife around the edge and turn out carefully onto a wire rack to cool completely. Store uneaten bread in an airtight container in refrigerator, as this bread has no preservatives and is chemical free. 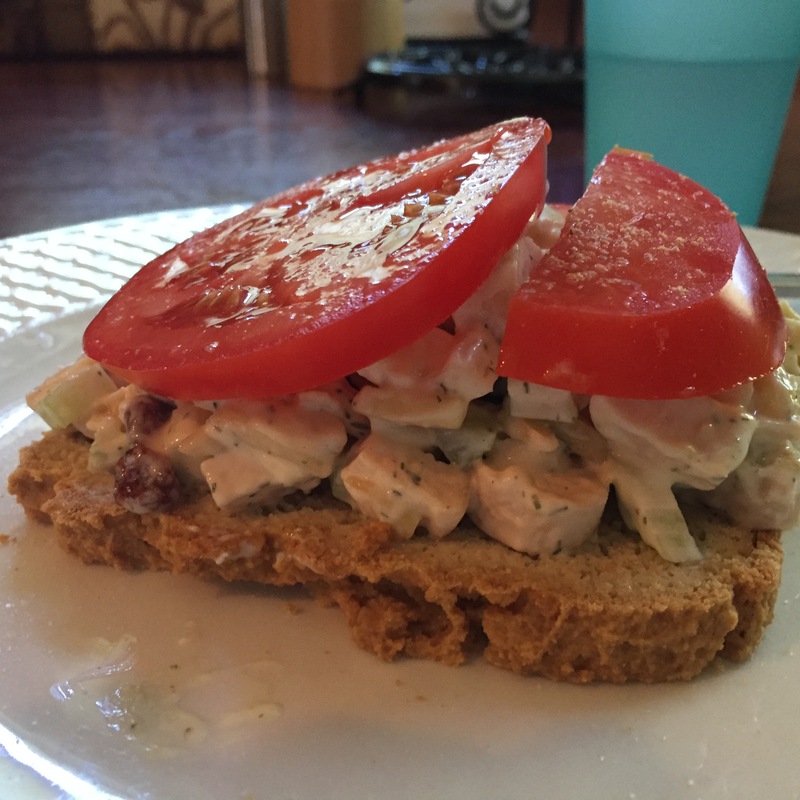 We’ve put chicken salad on it, almond butter, and it does crumble a bit, but it does make a sandwich. I’m going to keep searching for an even lighter bread recipe, but for now, this makes a good alternative if you are craving bread. I would say that open faced works better, because this isn’t pliable like regular bread, the pressure of two pieces might make it crumble. I haven’t tried toasting this, but I did put it in a pan and brown it slightly and that worked fine.